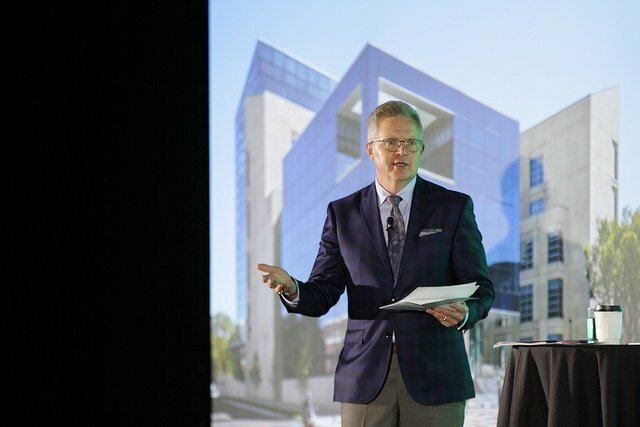 According to John Roberson, CEO of Advent, it’s not the latest and greatest amenities or technology that differentiates your university from the pack: it’s the stories you tell. 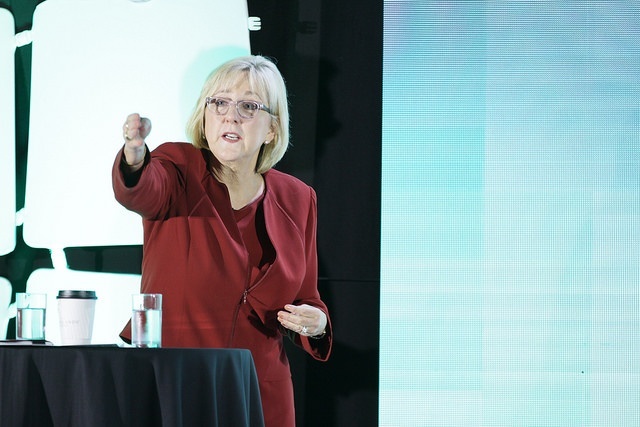 At the Higher Ed Facilities Forum, Roberson was joined by Donde Plowman, Executive Vice Chancellor and Chief Academic Officer at the University of Nebraska-Lincoln, to discuss how storytelling proved transformative for strengthening the fabric of the UNL community. When Plowman arrived at UNL in 2010, the college was experiencing a transitional period as they entered the Big 10. A confidence boost was needed as they prepared to compete against the best schools in the country. UNL was also struggling to showcase the stories of their successes and had lost connection to their unique spirit, and consequently, their donors, alumni, and faculty. The construction of the new College of Business -- the $84 million, 240,000 sq. ft. Howard L. Hawks Hall -- turned into something far more meaningful than “building a building.” Rather, it became a rallying cry that strengthened the community and turned the light back on for the school. Of course, every dream needs funding. In this case, it was entirely privately funded. The school didn’t have a history of fundraising or consistent alumni outreach; yet against all odds, Plowman’s team raised a staggering $150 million in six and a half years. In August 2017, they officially opened the doors to the state-of-the-art facility. Donde Plowman, the University of Nebraska-Lincoln. “A lot of professional fundraisers say, ‘You’re never going to get a million dollars out of someone who has never given you a thousand.’ However, by tapping into the heart and soul of what was really buried in our institution, we broke that rule repeatedly,” Plowman said. Throughout the process, Plowman learned that it’s essential to invite people into your dream by connecting with them on an emotional level. This means determining the following: Who are the audiences we’re trying to move, and what do they respond to? To successfully connect with stakeholders, her team tapped into the “Nebraska way of doing things.” Like many Midwesterners, Nebraskans treasure strong family values and are known to be hard-working, patient, and humble. Thus, to align with the modest nature of Nebraskan donors, a screen in Hawks Hall constantly scrolls and shows every single donor’s name in the same size font, regardless of the size of their donation. Plowman and the Advent team also went through a “story-mining” process to identify other emotional touchpoints that would resonate with stakeholders. As an outsider, Roberson was surprised by how many remarkable stories UNL had in their arsenal that weren’t being communicated. One well-kept secret is that Nebraska is home to more Academic All-Americans than any university in the country; yet, this accomplishment wasn’t being expressed in the design of the campus. There’s also no shortage of notable alumni, including the three founders of HUDL, a leading software company that allows coaches and athletes to review their performance. Now, upon entering the Henrickson Grand Atrium, a 14-foot-tall display features the founders of HUDL. Another display features an in-depth look at each of the six faculty members, with accompanying iPads that allow visitors to scroll through biographical information and academic publications of each of the professors. 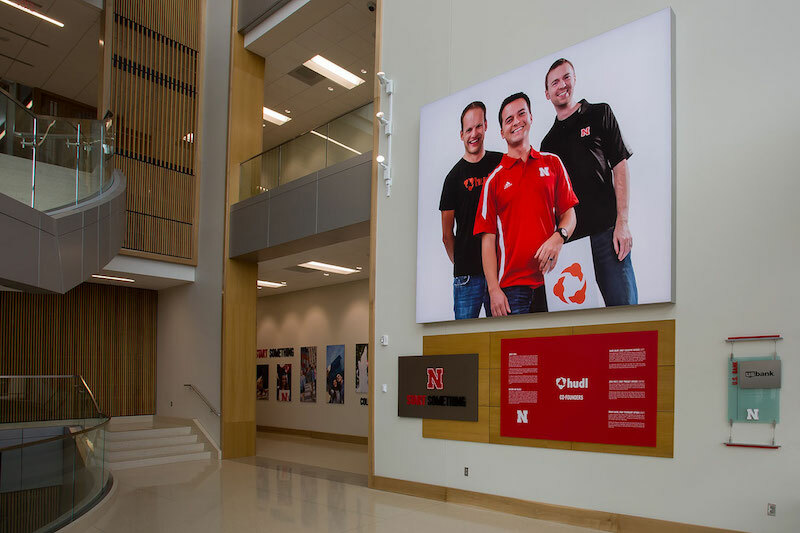 In total, there are eight digital displays that highlight the relationships created and fostered in the College of Business, and an additional 113 custom pieces of donor recognition. “When we built Hawks Hall, we tapped into what was on the hearts and minds of these humble Nebraskans, and in doing that, we began to recognize all these communities we had lost touch with,” Plowman explained. Each storytelling piece in Hawks Hall is guided by this theme, which is meant to encourage students to go for their goals. “Start Something” became a much-needed confidence booster and unifying mantra. “In partnering with Advent, John [Roberson] brought up the story of David and Goliath. David should never have been able to defeat that giant, yet to achieve he turned his very weaknesses into strengths. We began to use that as a metaphor by writing “Start Something” on stones and placing them in the center of tables during donor meetings,” Plowman shared. John Roberson, CEO of Advent. Recently, Advent partnered with Dr. Darin White from the Samford University Business School to study how prospective students decide on a college. Dr. White came up with the concept of the “eduscape”: the built, man-made environment, physical surroundings, or facilities of a college or university. The results of the study have huge implications for facilities leaders, as the quality of the eduscape was found to be the most important tangible driver of high school students perception of the college brand. Therefore, the facilities indirectly influence whether a student will utilize the college brand in their public persona. 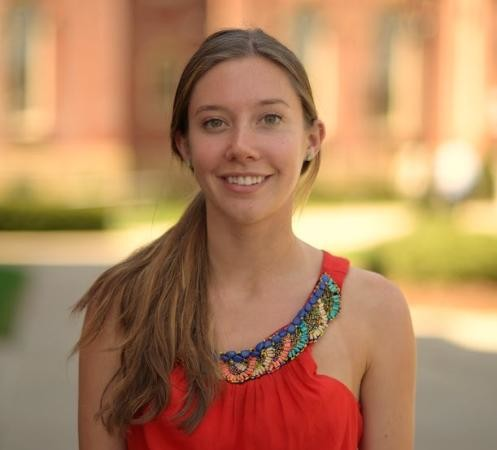 Roberson compared the findings to a millennial purchasing a pair of Toms shoes. When a young person buys a pair, it’s only partly because of the style--it’s also because the story of “Give a pair, get a pair” fits their public persona.” Many times, a purchase has little to do with product utility or features, but rather how someone personally identifies with that brand because of what it says about them. At UNL, the goal was for storytelling to be so embedded in the building that prospective students would be immersed in the energy of the program and tradition of excellence with or without a tour guide. Today, Plowman is proud to report that this is prominently on display. Realize that the eduscape is number one for prospective students. The building validates the promise of the university. Looks and packaging matter: Gen Z has had a camera on them since the day they were born. The eduscape is only going to increase in importance. Make it your goal to invoke strong emotional connections. Make the space worth sharing. This social media savvy generation is looking for those touchstones in the building to send out to their community. Prospective students, as well as your alum, want to belong--give them that opportunity via your buildings. Join us at HEFF 2019 to learn innovative approaches to lead higher ed facilities.